We love our stuff, stuff being the term affectionately given to the objects with which we populate our lives. In birding, we like to think that we don’t need much ‘stuff’. Just give us binoculars, a field guide, and a hat to keep out the sun and rain. Maybe a spotting scope. And a long lens camera. Some memory cards for that camera. Another book, maybe a bird finding guide. Rubber boots for shorebirding. You get the idea. Our ‘stuff’ allows us to bird more, better, further. It defines our birding lives when it’s not threatening to overwhelm our cars and homes. 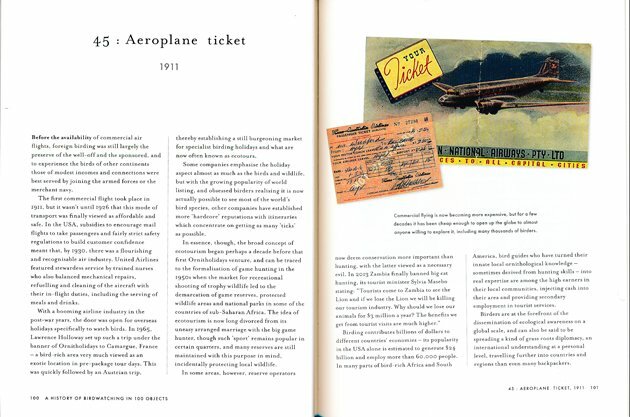 A History of Birdwatching in 100 Objects uses stuff, redefined as ‘objects’, a term that gives an archival sheen to everyday items, to tell our collective history. Written by David Callahan and edited by Dominic Mitchell, the book originated as a series conceived by and written for Birdwatch magazine, a monthly magazine out of Great Britain. The series looked at 25 objects. The expansion to 100 Objects in book format follows a publishing trend of popularizing history; recent examples include A History of the World in 100 Objects, The Civil War in 50 Objects, and even Doctor Who: A History of the Universe in 100 Objects. Author Callahan is a birder, trained taxonomist, and staff writer for Birdwatch magazine. Editor Mitchell is the founder and managing editor of Birdwatch magazine, managing editor of Birdguides, a birding news website, and the author of two books on the birds of Europe and Great Britain. They use the Objects concept as a framework for retelling the history of birding in an appealing, visual manner. It’s a fun read, and almost sneakily educational, the book equivalent of a birdwatching museum in London with very long explanatory labels. Birdwatching history starts in 45,000BP with the Arnhemland rock painting, a Paleolithic painting found in Australia’s Northern Territory that depicts “two Emu-like ratites in red ochre” (though the text does caution that the dating is not certain). The book races through the decades, pausing in ancient Egypt for a tomb painting of three species of geese and a papyrus falcon, in ancient Greece for Lysippe’s bust of Aristotle (the first writer to systematically study birds), in the 15th century for the Gutenberg printing press, and a brief stop in the Renaissance for Raphael’s painting of the Madonna of the Goldfinch. The European Goldfinch, we find out, was symbolic of the crucifixion and a common element in religious paintings of the period. Number 10, Stuffed Dodo at the Horniman Museum, London, c. 1700, is a fake, formed from a plaster cast of a real Dodo head and real Dodo feet combined with chicken wings and Ostrich feathers. I’m not sure what to make of this. The story of the flightless Dodo, discovered on the island of Mauritius in 1598 and killed off by 1700, is sad and familiar. The story of this fake object is, in a way, even more pathetic. It’s the first clue that using objects to tell history can enhance our understanding of the past. In 1877 we reach our first modern day technological object: no. 28, the Microphone. And, though the next 72 objects still encompass art and books and even clothing and places, the emphasis switches to the scientifically-based objects we adore: Porro-prism binoculars (no. 39, 1894), Aeroplane ticket (no. 45, 1911), Kodachrome 35mm film (no. 54, 1936), Hand-held mobile phone (no. 69, 1973), Perkin Elmer Cetus DNA Theral Cycler (no. 80, 1987), Gitzo Mountaineer carbon fibre tripod (no. 86, 1994). 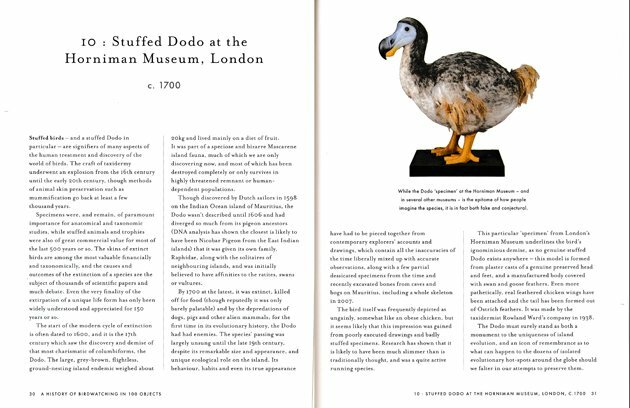 I quickly catalogued the 100 objects in the book and found that 41 percent are technology-related, 20 percent relate to books or other written objects, 8 percent are art-related (9 percent if you count the stuffed Dodo), and 31 percent belong in that wonderful category, miscellaneous. Two pages are devoted to each object, with the text taking up about three-quarters of the spread for most items. I expected a picture book; I got a collection of essays! In most cases, the object is the starting point for a broader tale. Number 33, Parabolic reflector, 1888, for example, starts with the invention of the reflector by a German physicist and broadens into the early history of wildlife sound recording technology. Number 57, Great Northern? by Arthur Ransome, 1947, starts with an affectionate recollection of a children’s book, in which a group of kids identify and protect a possibly rare bird (Great Northern Diver? ), and branches into an all too brief recounting of books and movies featuring birders. But, the limited space also means that information is sometimes compressed and limited. The book’s entry on John James Audubon (subsumed interestingly under Number 18: Pig bristle paintbrushes) states that Audubon was financially well off and able to draw and paint birds across the U.S. through the sale of a “business venture” and drawing lessons. It omits Audubon’s uneven business history, his bankruptcy, and the fact that Lucy, his wife, eventually had to support the family through teaching. 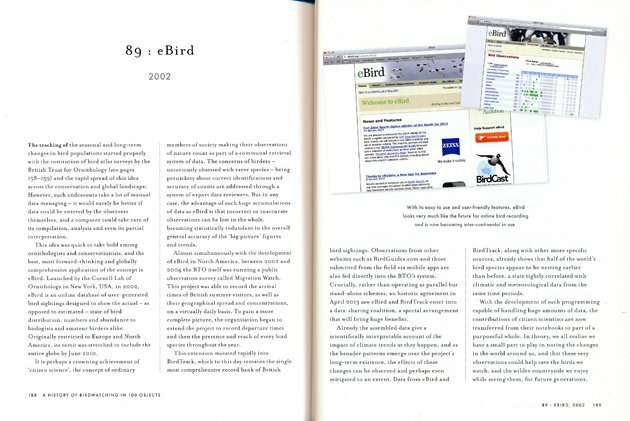 The entry on eBird (number 89) cites its citizen science basis as looking “very much like the future for online bird recording”, but then veers into a description of BirdTrack, the British database, rather than discussing the financial sustainability of the Cornell project. The book has a decidedly British slant. North American birding milestones like the first Christmas Bird Count or the Big Day tradition, precursor to competitions like the World Series of Birding, are not amongst the 100. Though efforts were clearly made to include U.S. figures like Audubon and Roger Tory Peterson (no. 52: Peterson field guide, 1934), there are entries like YOC Badge (number 65), which are British only. (YOC was the Royal Society for the Protection of Birds’ Young Ornithologists’ Club. I think this essay on birding activities for youth could easily have included a reference to its North American counterpart, the ABA’s Young Birders programs.) On the other hand, some of the British objects are charming and unique. 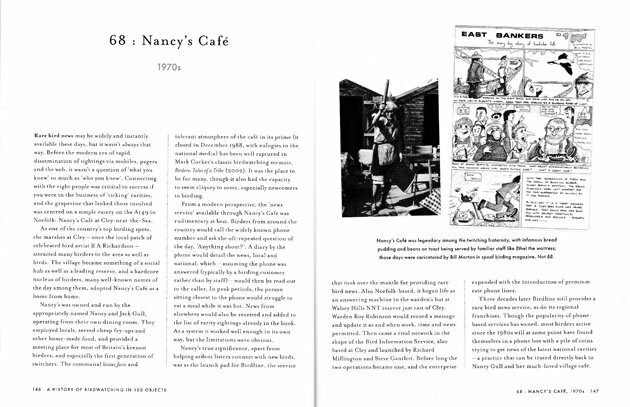 What birder would not want to have been a part of the crowd at Nancy’s Café (no. 68), informal birding headquarters near the marshes at Cley, where birders answered the phone because it was likely to be another twitcher on the other end, asking for the latest rare bird news. What 100 objects would you select to tell the history of birdwatching? It’s not as easy as you may think. Do you include objects related to ornithology–published taxonomies and proceedings or a conference program from an ornithological organization, and if so, which one? Do you include objects related to conservation–a copy of Silent Spring, maybe a photo of one of the lime traps that kill thousands of songbirds in Cyprus? Is your object the first of its kind, as in the first field guide, or the best of its kind? Will your list be North American-centric, with entries on the Nuttall Ornithological Club, ABA birding ethics , and a photo of Martha, the last Passenger Pigeon? Or will it encompass the history of birding around the world? A History of Birdwatching in 100 Objects offers us the opportunity to think about these questions, have fun with them, possibly even start our own lists and books. It is not a substitute for traditional histories like Scott Weidensaul’s Of a Feather: A Brief History of American Birding, but it does have a long chronological timeline, occasional geographical breadth, and, because it is not presented narratively, the freedom to throw in the unexpected. Gore-Tex! Policeman’s notebook! Road signs! How many history books include these items? I can’t think of any. But, they are really important to how birdwatching developed and how we bird now. 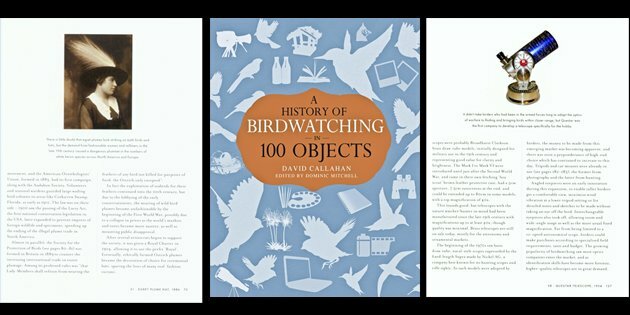 If you enjoy taking in your birding history in small, highlighted, playful doses, then A History of Birdwatching in 100 Objects is a book you would probably enjoy. It is relatively expensive, so put it on your holiday wish list (it’s never too early). Or buy a less expensive eBook version. And, then let me know what objects belong on your personal birdwatching history list. Hardcover, 224 pages, 9.8 x 7.6 x 0.8 inches. Thank you, Grant and Rick! Jochen, I think there is still work that needs to be done on those rubber boots. Like, making boots that fit small feet and short legs! They are more important than bins in certain areas in the U.S. as well, particularly the famed East Pond of Jamaica Bay WR. Rick–Power Steering! That really should have been in the book. And, I agree with Howell and Webb as well. I love Sophie Webb’s bird illustrations. Rubber boots – as you mentioned – are possibly even more important on my home turf than binoculars. I can do a lot of my birding here by ear, but walking around without rubber boots?! ?